Yes, another breakfast recipe – that makes two in a row. So shoot me. 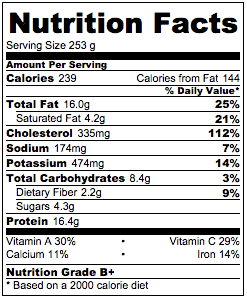 And it’s another healthy one, to boot. Just like my apple crumble smoothie, the name may make you think otherwise – a full English breakfast isn’t exactly known for being a light option – but I’ve adapted the traditional fry up just enough to make it a good, healthy breakfast option. So, let’s start with the usual full English. 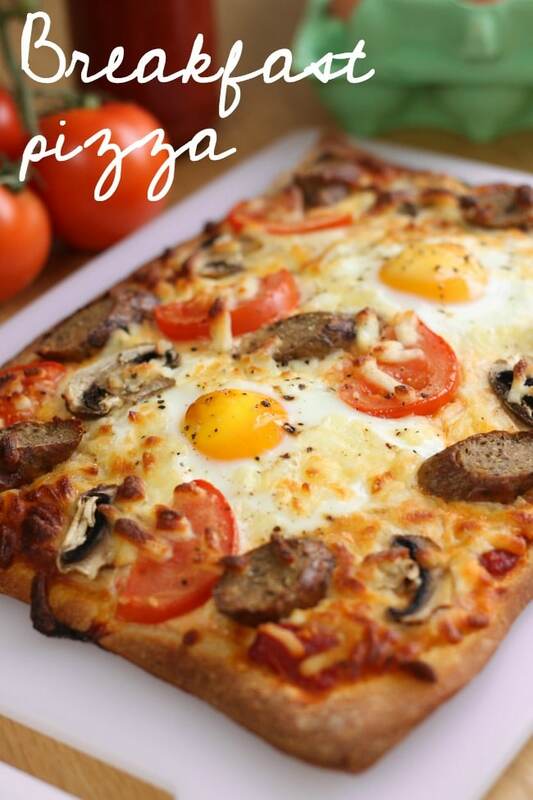 It’s known as a ‘fry up’ for a reason – it’s pretty much a load of fried stuff, piled high on an enormous platter. Fried bread, fried mushrooms, fried eggs, fried tomatoes, fried sausages (veggie ones for me, of course)… you can feel your arteries clogging with every bite. So this time, I decided to take the ‘fry’ out of a fry up, and make baked eggs instead. And before you all balk at the idea, let me assure you: once you dig in, you’ll realise that all that extra oil isn’t doing anything other than making your breakfast super greasy. The flavour is all here. 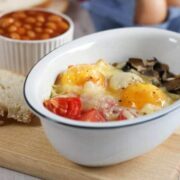 As an added bonus, these full English breakfast baked eggs are much simpler to make than a fry up. You don’t need to supervise multiple pans as they spit oil all over you, or worry about making sure everything is ready to serve at the same time. Just throw some tomatoes and mushrooms in a dish, crack on your eggs, and pop them in the oven while you go off to brush your hair, or get dressed, or whatever else normal people do in the mornings. To add to the full English flavour, I also added some vegetarian bacon lardons to my baked eggs. You can skip these if you’re not a fan of ‘fake meat’, but they did add a sense of authenticity to my breakfast, and a lovely smoky flavour. I used Quorn brand, but there are other varieties out there. If you prefer, you could use diced veggie sausage instead (or as well!). The bacon and sausages will need cooking off quickly before assembling your baked eggs, but that only takes a few minutes. Oh, one other thing – I sprinkled a teeny bit of cheese on top of my eggs before baking. Not a traditional ingredient in a full English, I know, but I find that the cheese helps the eggs to bake evenly – otherwise, I sometimes find that the yolk has baked solid while the white is still gooey. This way, you get a nice runny yolk – perfect for dipping a slice of bread or toast. 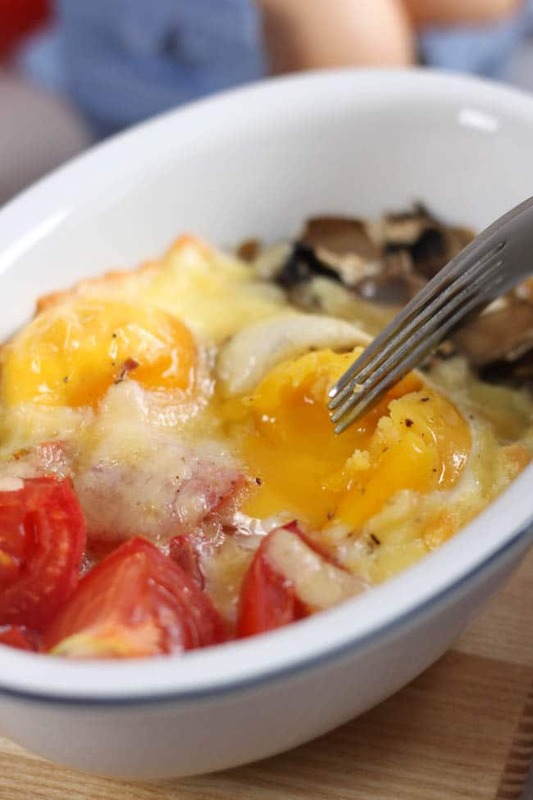 If you’re a baked egg expert, though, feel free to skip the cheese! 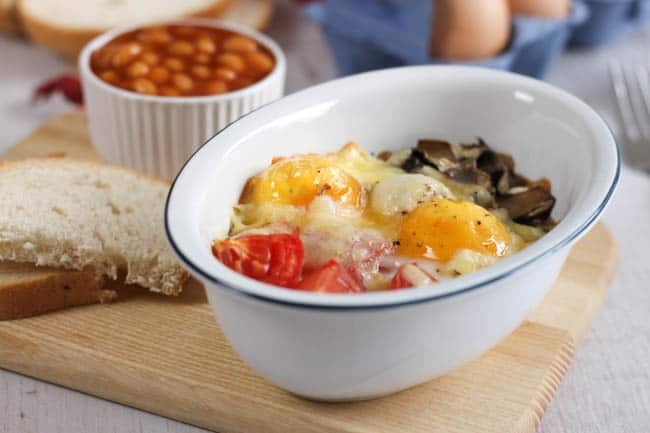 I also served my baked eggs alongside some proper British baked beans. Next time I might try cooking the beans underneath the eggs – but I haven’t tried that yet, so don’t tell me off if it doesn’t work! If frozen, fry the vegetarian bacon lardons for a few minutes until thawed (I didn’t use any oil). Add the sliced mushrooms, veggie lardons and diced tomatoes to two individual dishes or large ramekins. Crack two eggs into each dish, and sprinkle the cheddar over the whites of the eggs. Top with black pepper, and bake for around 15 minutes, or until cooked to your liking. What a fab idea esp as I do actually have some veggie bacon in the freezer. Yum. I have a similar recipe coming up on my blog soon, love this! Runny egg yolks are the best! Awesome tweaks to a popular dish! Thanks for these ideas, Becca! oh yum! This looks amazing – yummy and light! I would love to give it a try this weekend. This looks so good! Will have to try it this weekend. 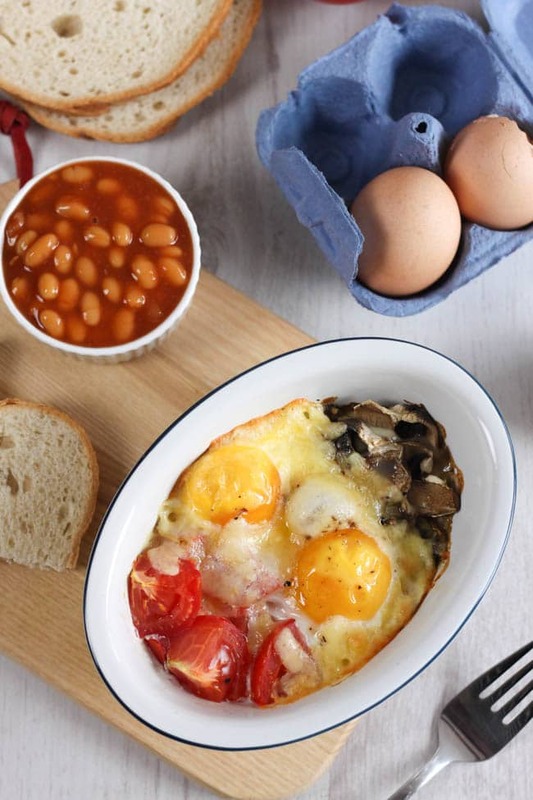 Yumm I’ve just been thinking I’ve never had a baked brekkie before with eggs in it like this, this looks so filling and like the perfect Sunday breakfast. You can never have too many breakfast recipes! 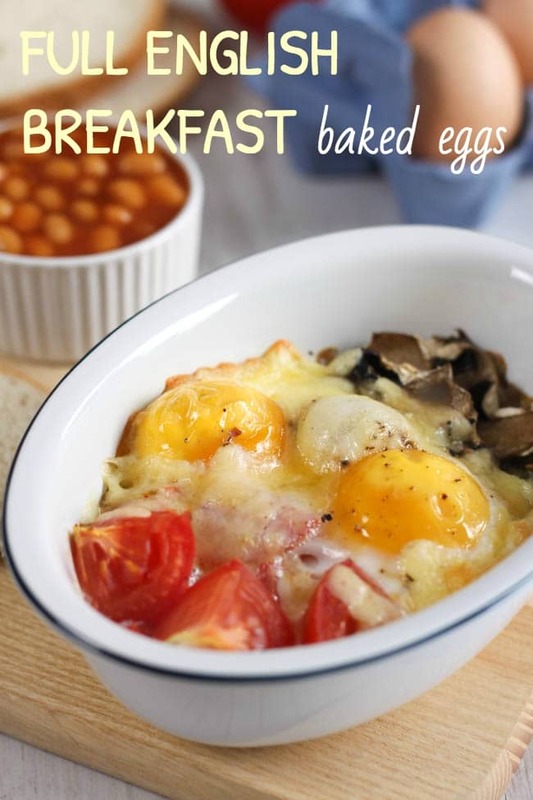 This breakfast looks fabulous and has got me hungry even though I’ve just had breakfast! I didn’t know you could get vegetarian lardons! 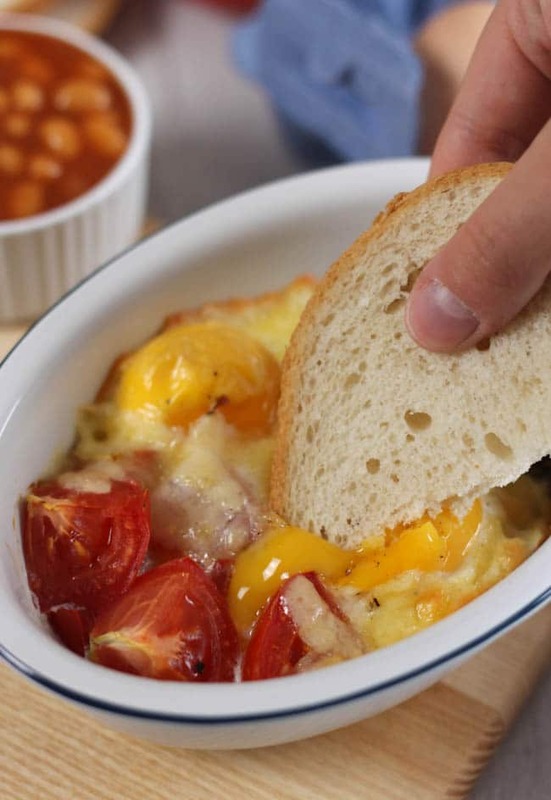 My take on baked eggs is here. I always add cheese if I do them in the microwave, but not in the oven – I add a scant tablespoonful of milk, instead. 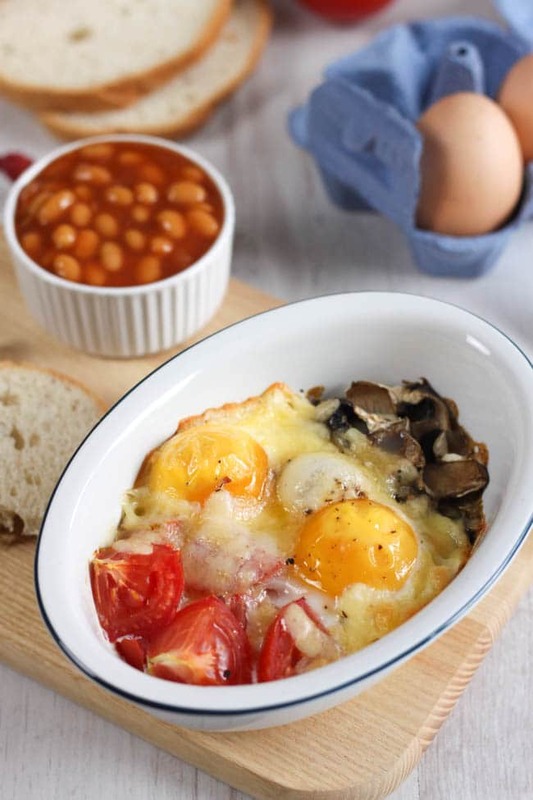 Baked eggs are a memory from childhood…. I shop for the mushrooms. How yummy does this sound! Fingers crossed I will have something very similar for my breakfast tomorrow. As long as my girls are feeling generous and lay me a few eggs!